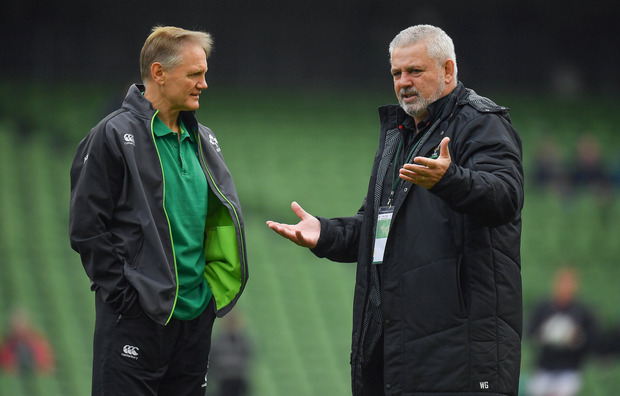 Neil Francis: I couldn't sleep this week and came to a shocking realisation - Ireland are now playing Warrenball! I couldn't sleep the other night - something just gnawing at me. Just something vaguely familiar about the way Ireland are playing their rugby. Get the pack going forward, one-out runners, get them around the corner and garner some momentum and a little room and then progress from there. Then you pick two huge men in the centre. The enormous 6ft 4in, 18-stone Chris Farrell will do just fine. Get him to hit it up, quick ruck ball - get it around the corner again or reverse the direction and suddenly you are in charge. They do say that imitation is the sincerest form of flattery. Wazza must have been watching last Saturday week thinking - these guys are taking the piss out of me. I get slagged off for playing a fairly rudimentary form of the game. I change my style and these b******s are now doing what I was doing back in 2008 and 2012 when I won my Grand Slams with Wales. The Welsh, lest we forget, scored plenty of tries in their two Grand Slam-winning seasons with Wazza. Ireland are scoring tries for fun as well and if they play well this Saturday they have a good chance of four or more playing 'Joe Ball'. The problem is that the Scots could do likewise. I don't care if Ireland play 'Saddam Ball' on Saturday nor do I care whether it is a limited style of rugby, as long as they win - preferably without any more coronary-inducing acts of charity or omission. Let's cut to the chase - I favour Ireland strongly. I think they have too much fire-power for the Scottish eight and if they concentrate on pummelling them off every breakdown Scotland will not be able to cope for the full 80. Ireland demonstrated some pretty relentless phase play against Wales and in patches even against the French. For Scotland it will have to be no passengers and all crew. Scotland performed creditably upfront against England. Way too smart at the breakdown and aggressive and dynamic at the ruck where England thought they could protect their ruck ball with minimum entry of players in to stand over it - one maybe two. Scotland recognised the moment, got numbers in and stole or slowed down a lot of ball. It begs the question - how good are England? We will know a lot more after they play France in Paris. That pack that walked out in Murrayfield are a very decent unit but British Rail's favourite customer flogged them to death in the two weeks before the Scottish game and apparently they have been horse-whipped to within an inch of their lives for the last 10 days. I am surprised they were able to walk on to the pitch. England were listless and yards off the pace. Eddie Jones saw how the lumbering French pack were beaten at the breakdown by Scotland and still decided to choose Nathan Hughes and Courtney Lawes in his back-row. They were at sea at the breakdown and the admirable and normally combative Chris Robshaw was suffering from the same army-camp fitness-regime malaise that the rest of the English front five were suffering from. If Jones had rested his horses and was able to call upon Sam Simmonds and Sam Underhill I reckon they could have squeaked it. Last year before the Scottish game in Murrayfield I suggested that Ireland have a real pop at scrum time. This was said on the basis that if you put on the power at scrum time and assert yourself in this phase away from home it gives you solid purchase to get in and control the match. I also suggested that Ireland go for it in that department because Scotland were very, very light on quality scrummaging props. Nor were their pack geared up to go macho with anyone at the set scrum. Their mantra was ball in, up and gone. The ploy was the right thing to do - but who was to know that Scotland would only get one bloody scrum in the whole game. Ireland only got five but they minced the Scots and took them for a walk down the field. Ireland got three scrum penalties - that was never going to win them the game. Ireland were too sluggish in the first half and paid the penalty. This game will be decided at the breakdown but if the Scots don't have to scrum and if Ireland don't wear them down in this phase the Scots will run all day. Even using the tactic of getting Conor Murray to break without the ball to draw the Scottish back-row off the base of the scrum will pay dividends. Another factor that skewed the result last year in Murrayfield was the fact that Johnny Sexton did not play. Paddy Jackson had a decent afternoon but there is a chasm in quality in terms of game management and Sexton's mere presence on the field makes all those around him perform at a different level. Finn Russell will take a liberty if it was Jackson facing him. Sexton's game persona is a different matter. Ireland are a mature side who won't get suckered into a fast and loose game. The trick to subduing Scotland is by suppressing the tempo. We know that there will be a lot of kick-chase and patience is required with that. Field position is key to stopping Scotland throwing the ball around. It is true that Russell was near his own 22 when he threw that cut-out pass to Huw Jones. It was a low-percentage play that caught England cold but the Scots got away with it... in Murrayfield. There will be moments when Scotland get to play - uncomfortable moments when Ireland will get exposed in midfield or on the tramlines. It is hard to hem Scotland into their own 22 for the entire game but that is what I expect Ireland to do, and to dominate the ball in the red zone. It seems obvious but I think Tadhg Furlong and Iain Henderson, if they are both fully fit and last the whole game, will have a huge influence. To introduce two Lions who have had a month's rest is huge. Stander and Peter O'Mahony have been relatively quiet and coming down the home stretch it is time for them to produce performances of authority. If the Scots are made aware from the start that this is a determined and ruthless Irish side that have no intention of losing - well then that is what will happen. I don't care if Ireland play 'Warrenball' again - just win the game!